THE BRIEF: This ad was one of several web banner ads developed to promote HSBC's new Climate Change Fund. 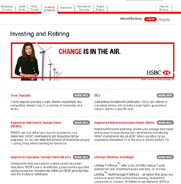 The ads followed HSBC's branding guidelines and campaign strategy, emphasizing the positive result of investing in the environment. 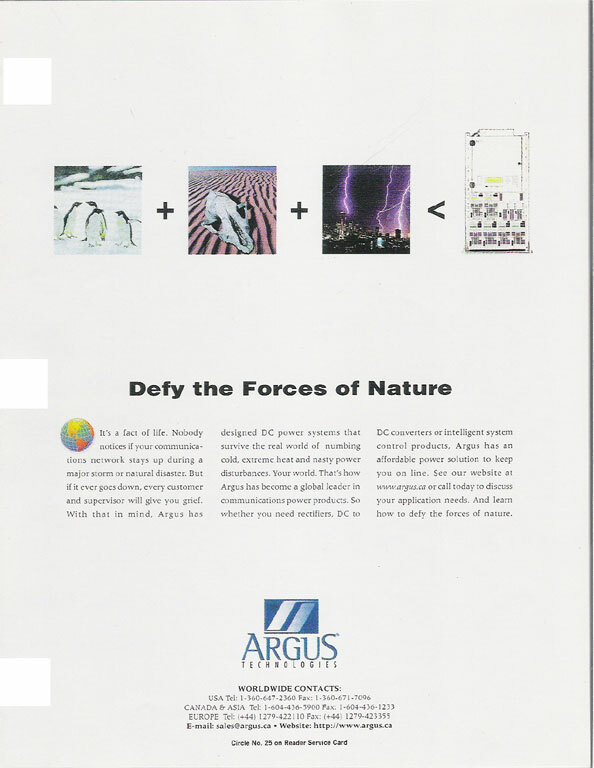 THE BRIEF: This ad was the first in a campaign developed for Argus Technologies. The campaign ran in trade magazines for more than three years. 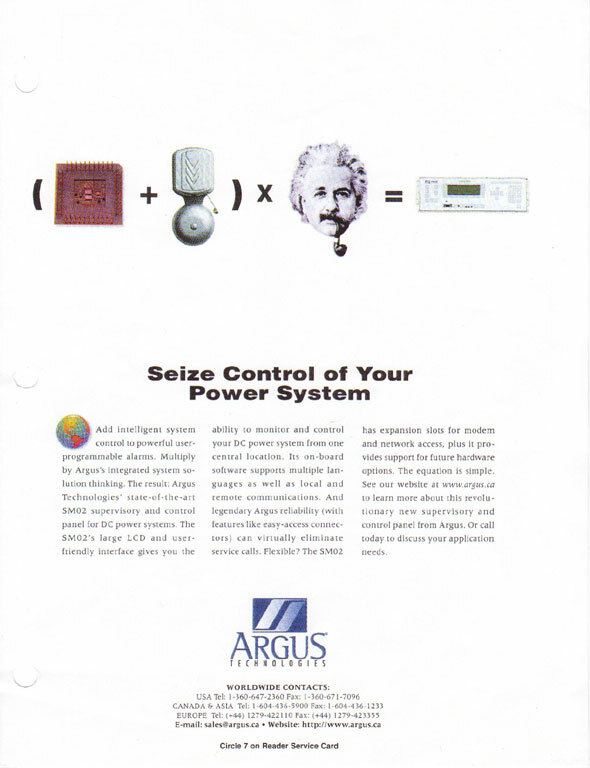 The ad's "equation" concept resonated with telephony engineers, who showered Argus with sales calls. 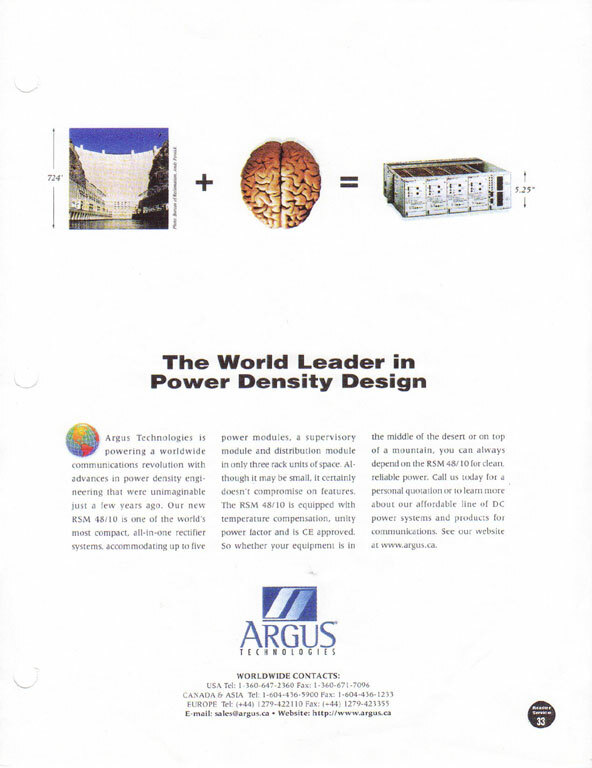 During the course of this campaign, company revenues quintupled to $145 million. THE BRIEF: Catalyst is one of North America's leading manufacturers of mechanical paper and pulp products. 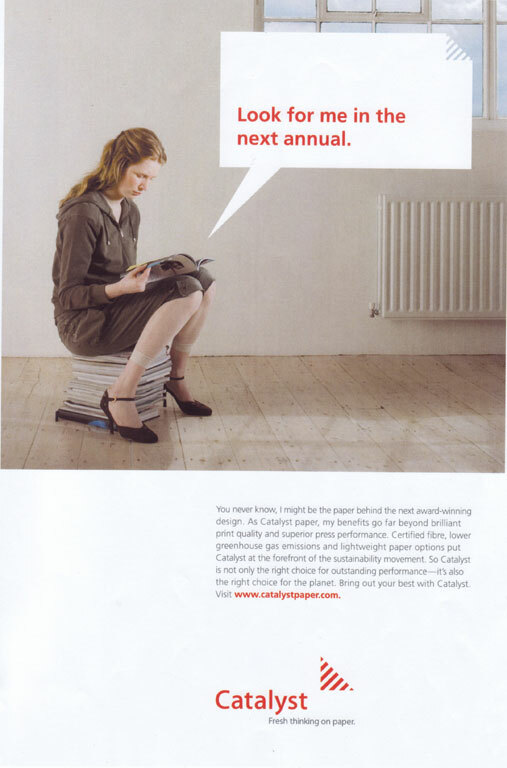 This ad introduced Catalyst's brand to designers, writers and other creatives, who are major purchasers and specifiers of paper. It emphasizes the strong environmental pedigree of Catalyst, beyond product quality and press performance. 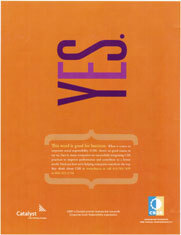 The ad conveys benefits by giving the products a "voice." 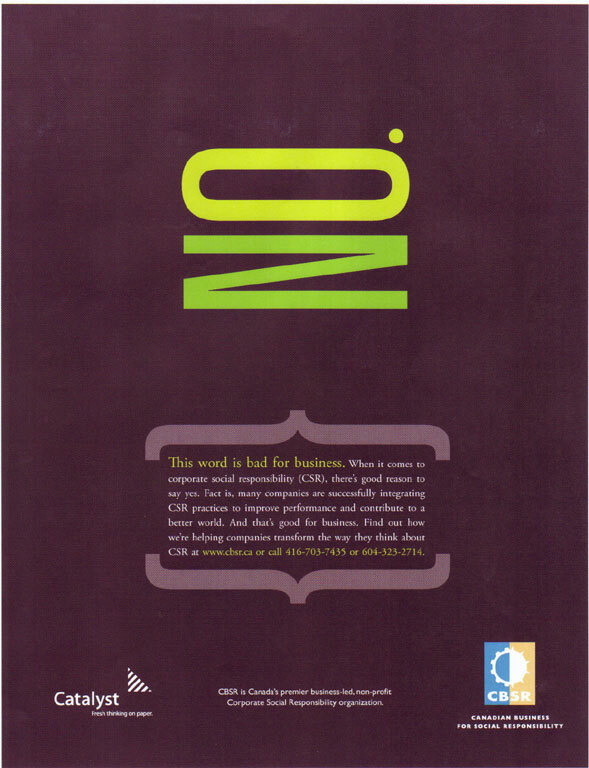 This ad not only raised Catalyst's brand equity within an important new market, but also differentiated the company from competitors. 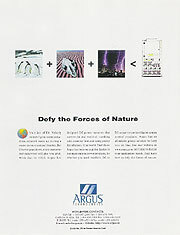 This ad won a Summit Creative Award for Best Trade Ad. THE BRIEF: As Canada's premier business-led corporate social responsibility organization, CBSR wanted a creative way to boost its public profile and attract new members. 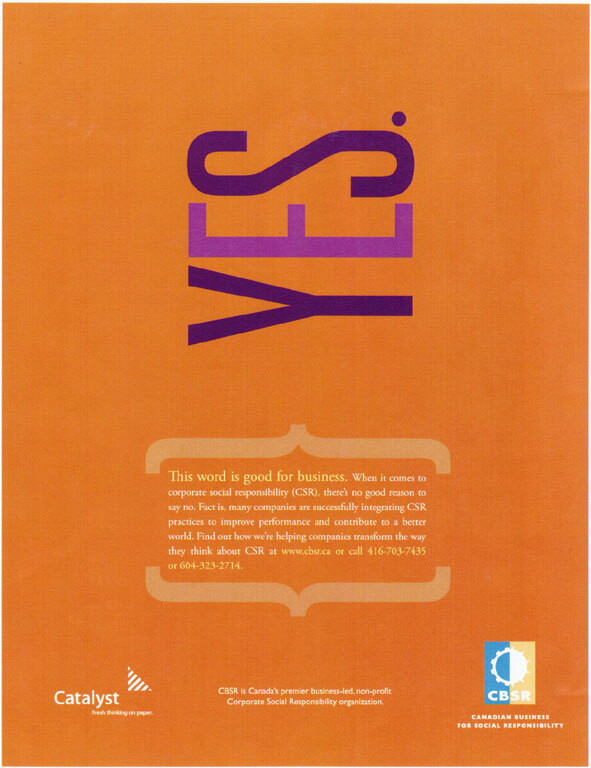 The result was this "Yes/No" ad campaign, which pairs common words with uncommon visuals to attract, intrigue and persuade. 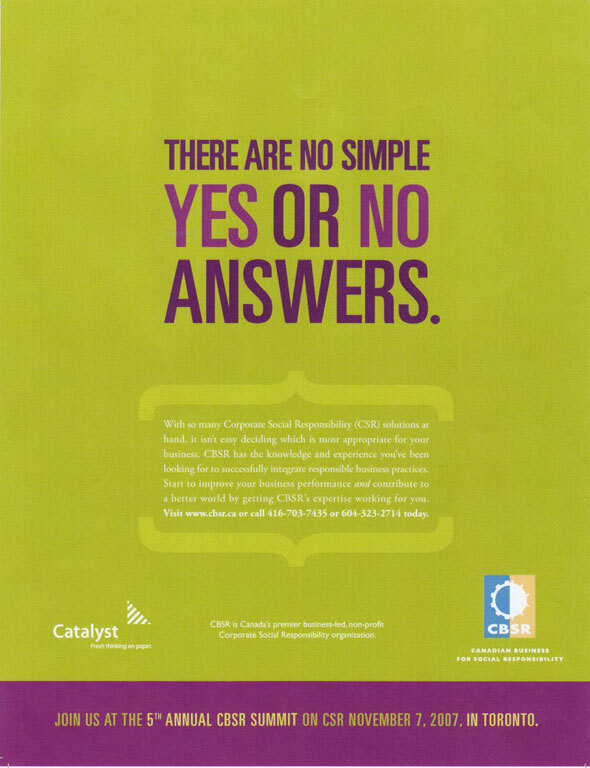 Targeted at business executives, the first two ads stress the business and social benefits of integrating CSR practices, while the third ad emphasizes how CBSR membership can help with strategic decision-making. 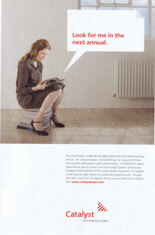 These ads are flexible enough to stand alone or in sequence within the same publication. Membership doubled during the course of this year-long campaign. More samples available, call or email for details.